This Flower of Life pendant is made with Sunstone and Moonstones. The body of the pendant is cast with crushed Noble Shungite, 23K Gold Leaf and Quartz crystal. 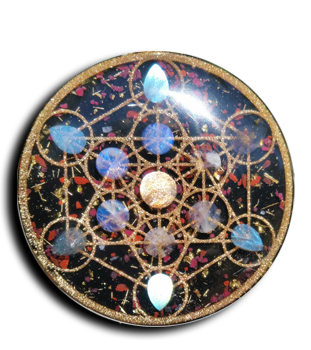 The Flower of Life design is cast in brass powder and also glows in the dark. This pendant is cast in Noble Shungite (which is 99% C60/70 – Fullerenes – Carbon Buckyballs) with crushed Tibetan Quartz and 23.5K Gold Leaf. The detailed geometry is cast in a Brass powder with green glow dust. It is inlaid with Jasper, Burgundy chips and Galena.